High school and university education should not be wasted on girls. Women should not be expected to enter the fields of science, medicine, law, or engineering. Women do not deserve equal pay with men because women are usually supplementary wage earners. Women usually become pregnant and leave. It’s a waste of time and money to train them. A woman cannot be expected to do a man’s job. A lot of men would not work for a female boss. A lot of unemployment among men is due to women in the labour force. These ideas are no longer politically, economically and/or socially correct. Today, we support equal opportunity and equal pay for work of equal value. We oppose discriminatory hiring. 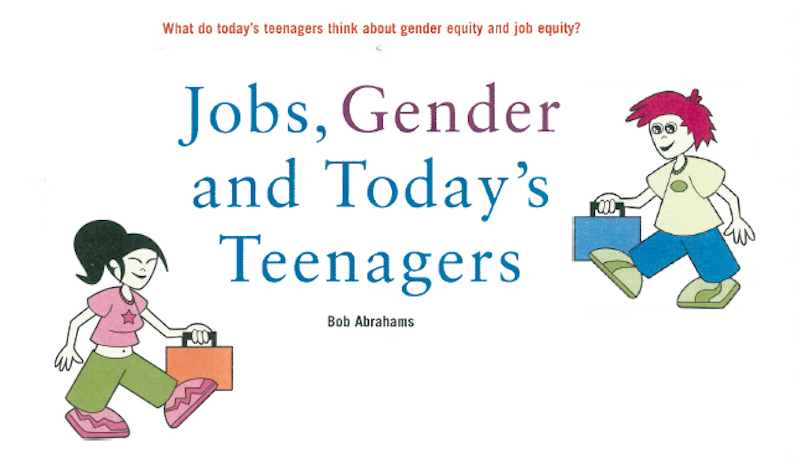 Yet, what do today’s teenagers think about gender equity and job equity? I decided to investigate. I asked a group of Grade 8 students and two groups of Grade 7 students for their thoughts on these issues. Some of the results of this admittedly unscientific poll were shocking, particularly after all we have tried to teach our students about gender equity and non-discrimination. Personality characteristics More girls than boys said being: ambitious, kind, passive, timid, assertive, sensitive, boastful, tough, gentle, loving, rational, and emotional were “ gender free” characteristics. In one class, a minority of the girls classified these as “ gender relevant” characteristics. A majority of the girls ascribed qualities such as passivity, dependence and aggressiveness predominantly to women. Boys were more gender specific. They were apt to ascribe adjectives such as: boastful, strong, daring, forceful and dominant to men. Boys were more apt than girls to ascribe characteristics such as: loving, aggressive, submissive, kind, passive, forceful, dominant, and tactile to women. On the other hand, girls were more likely than boys to say that assertiveness, changeableness, dependency, and sensitivity were male characteristics. Students who responded that these personal characteristics were neither predominantly feminine nor masculine, were girls. When it came to classifying various occupations as being either masculine, feminine or gender neutral, in one of the three classes more boys than girls classified these occupations as gender neutral. In the other two classes, the majority of gender neutral respondents were girls. For example, boys were more likely to say that being an engineer, forest ranger, mechanic, pilot, and surgeon were male occupations. In two of the classes, a majority of girls agreed with the boys. Boys were more likely to classify interior decorator, pre-school teacher, social worker, librarian, hair stylist, nurse, and veterinarian as female occupations. Girls were more likely to classify all those occupations as gender neutral. However, if a student indicated that forest ranger and surgeon could be feminine occupations, that student would be female. In addition, if a student were to describe veterinarian, interior decorator, social worker, and surgeon as predominantly male occupations, that student would be female. From the small number of students surveyed, I concluded that more young girls than boys have accepted the idea that “you can be anything you want to be.” Boys are more likely than girls to classify various personality characteristics and occupations as being gender specific. Girls were much more likely than boys to say, and to believe, that personality characteristics and various occupations can be classified as belonging to, or open to, both sexes. As we enter the new millennium, we are approaching a more aware and accepting society, but we still have a way to go. Bob Abrahams teaches grades 7 and 8 at W. J. Watson Public School, Keswick.